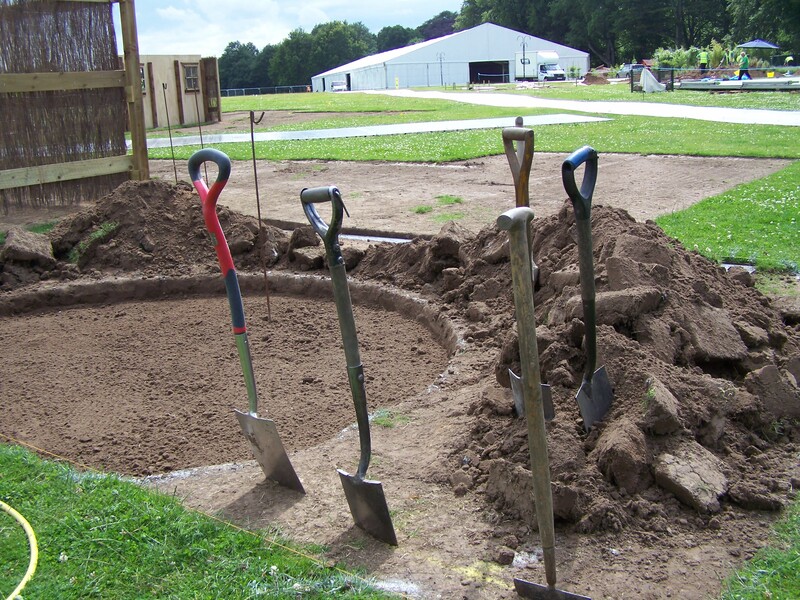 It is now day eight of the Tatton build and up till today it seems that we have been blessed with mighty fine weather; a bit of a novelty for this event as it is renowned for its inclement weather conditions. Despite the sun I still have a couple of perennials that are not quite in flower, the talking and fondling of foliage doesn’t seem to be helping either. They may not make the grade and will probably end up being sent back to the nursery as time is running out. My beautiful new trees arrived yesterday after a heart-in-mouth moment earlier in the week when the original specimens arrived far far too tall. Six initial replacements didn’t make the grade either so the ordering of these new specimens and their arrrival in time yesterday was hugely critical. They are now planted, trimmed and all tweaked and I have to say they are looking great. Planting has started, but today it is my mission to get it completely finished and with the worst sleep to date I’m heading in super early to get a head start. We’ve even been put on the ‘early list’ so we can actually get on site an hour early. 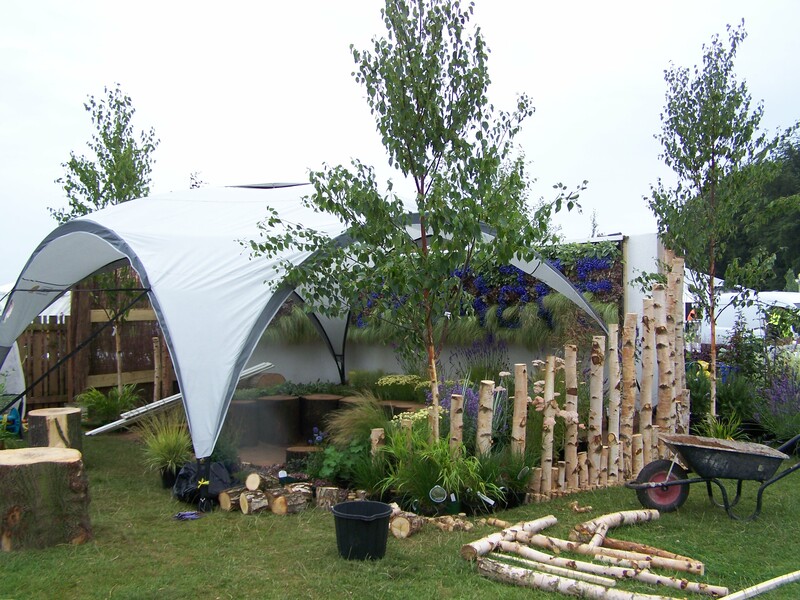 I suspect the ‘Coleman event shelter’ will be worth its weight in gold today…we’ve positioned it over the garden so the work can carry on full steam ahead whatever the weather! The niggles, the worries and the sleepless nights are all gaining in momentum. 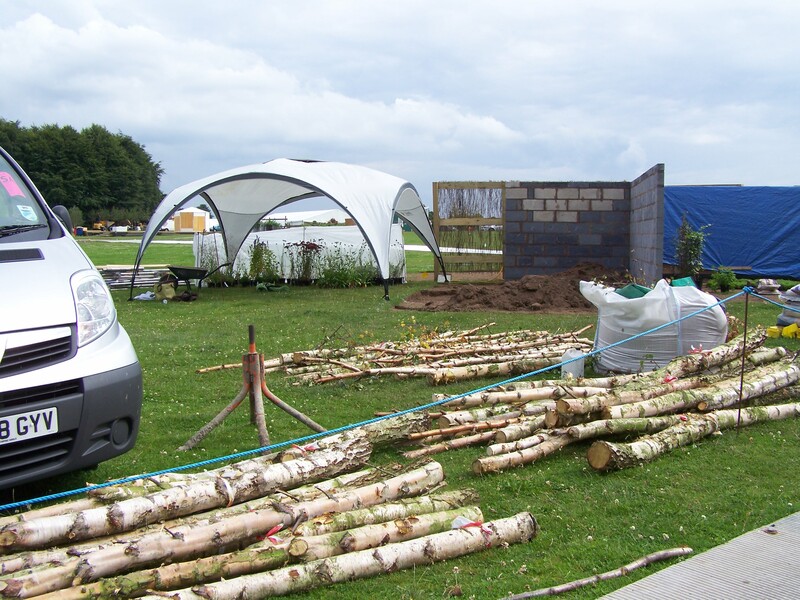 Progress has been steady over the last two days and has focused on the two wood features in the garden, the seating and the birch screens. 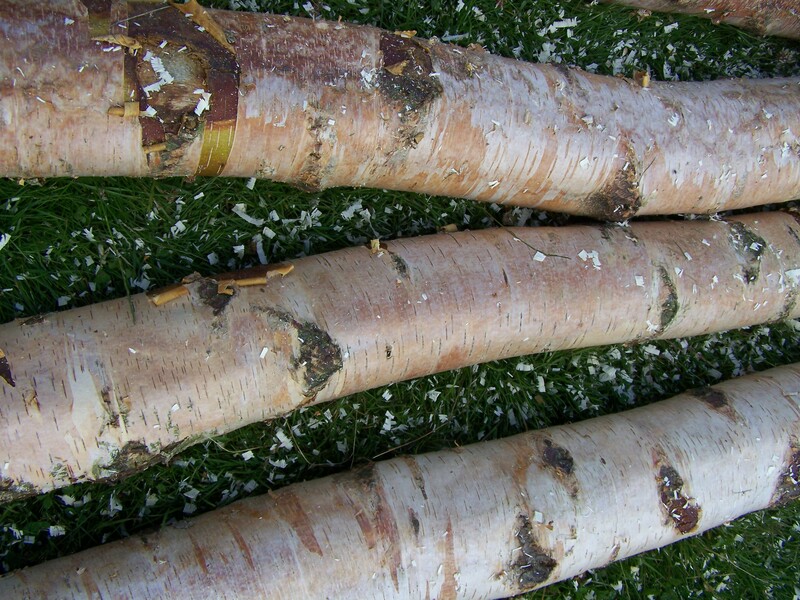 The logs we thinned out from a friend’s [Tom’s] woods have been cut to size, lovingly and meticulously scrubbed to reveal the beautiful peachy white hues of the bark. The careful shunting of the rather large oak and poplar tree trunk sections into position for the seating has also taken place… along with more scrubbing and cleaning. The majority of plants arrived today and are now sitting in pride of place under Graham’s Coleman event shelter as well as sprawling out across the rest of our surrounding space. 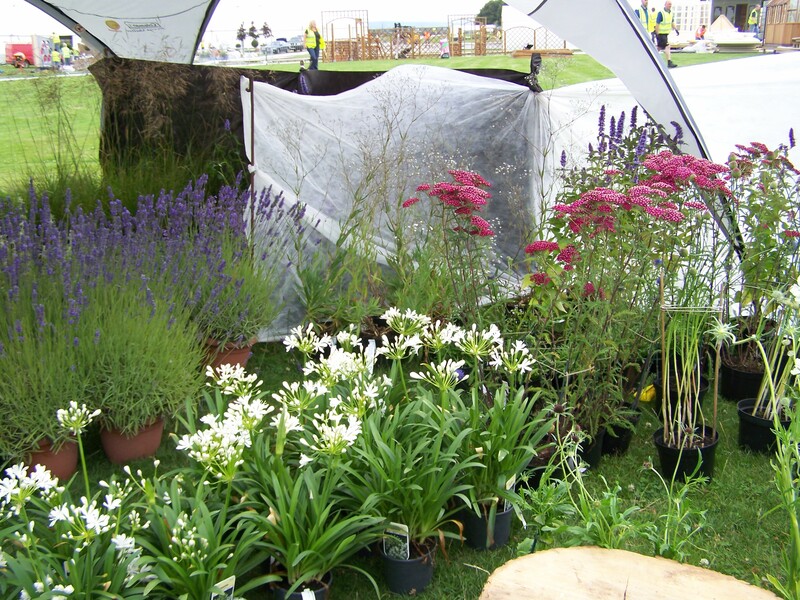 You can never have too many plants…always best to have more than you actually need! Still waiting on some other specimens to arrive though including some replacement birch trees. Remarkably, the night before the big day my mind was not worrying about all the things that could possibly go wrong during the build for St Ann’s Hospice’s garden ‘Embrace’… the plants going over, plant heights, soil levels, fixing the living wall modules, assembling the extensive irrigation system, the seating and screening not turning out as expected, the weather, the genuine block wall going up in time, the pebble paving… I could go on. But, thanks to my landscaper, Graham, my mind was firmly focused on his last words to me that Friday evening…”I have a lovely surprise for you in the morning, you’ll love it”. The surprise I would never have guessed. 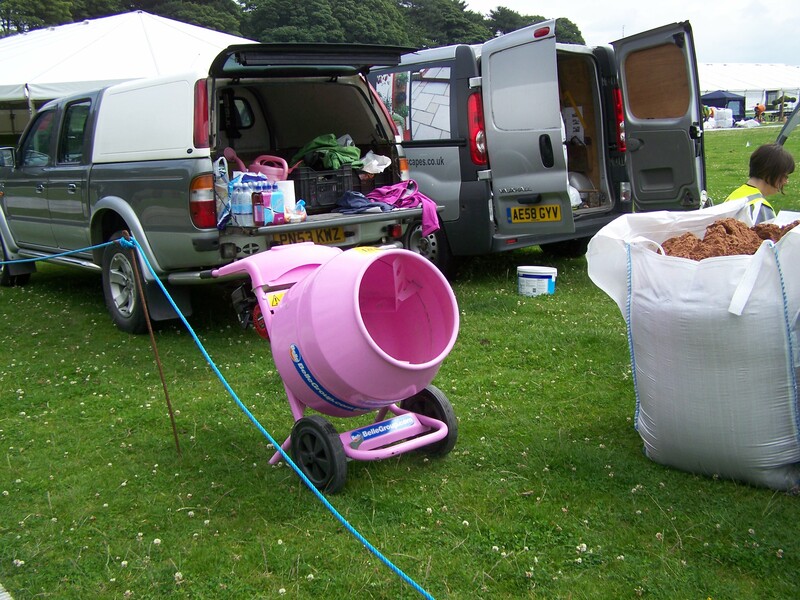 A brand spanking new PINK cement mixer kindly donated to use for the build up week by Travis Perkins. It’s certainly turning a few heads that’s for sure! This, together with a super enormous Coleman event shelter [I remember the pair of us drooling over Chris Beardshaw’s team’s event shelter in 2009; Graham was so smitten with it he went and bought one!] kicked the day off to a great start. The first day always involves faffing. Here I mean important and constructive faffing… marking out, double checking measurements, digging, more digging and starting the foundations. Wall heights are a big issue in the back to back category as no one wants a neighbouring wall towering above anyone elses. We’re on a sloping site so careful calculations and negotiations with the Show Manager have taken place. By end of play, with the help of our volunteers Andy and Adam plus the two lovely fund raising ladies, Clare and Wendy, all is set for the arrival of the super brickies in the morning. The block wall shot up at a phenomenal rate of knots while I raced down to Garstang, Preston [with hubby roped in to help out] to visit a great little plant nursery for some back up specimens/ substitutes and to collect the pile of birch tree logs we helped fell a couple of weeks back [wood thinning]. The plant sourcing proved successful, although I hadn’t planned to purchase so many and it was a very tight squeeze to fit them all in the back of the Ranger. The next stop for the logs presented an unexpected challenge. The dodging of swarming bees. Well, if I’m honest more like legging it out the way and jumping in the Ranger until the coast was clear…Ranger electric window decides to quit working at this crucial ‘take cover’ moment…not at all good. The gods must have been with us as the bees shifted up and away over the farm house. I was later coaxed round by the bee keeper to see if they had landed…a crawling, buzzing bough of honey bees. Magnificent. Bees… and cute little kittens… distractions over, logs loaded, the journey down the M6 to the Tatton site was a noisy, breezy and wet one. Any electric window experts passing Tatton tomorrow…please help. Back at the garden and the walling is up, ready and waiting for the rendering; which is the first job on the to-do-list in the morning. Getting the logs tidy and marked up for cutting is the next challenge, together with the start of the constant on-site plant nurturing regime…dead-heading, staking and watering. Thank goodness for all the volunteers!